Glenelg shire is one of the few post 1994 municipalities in Victoria which was given a name of a shire which preceded the amalgamations in 1994-95. 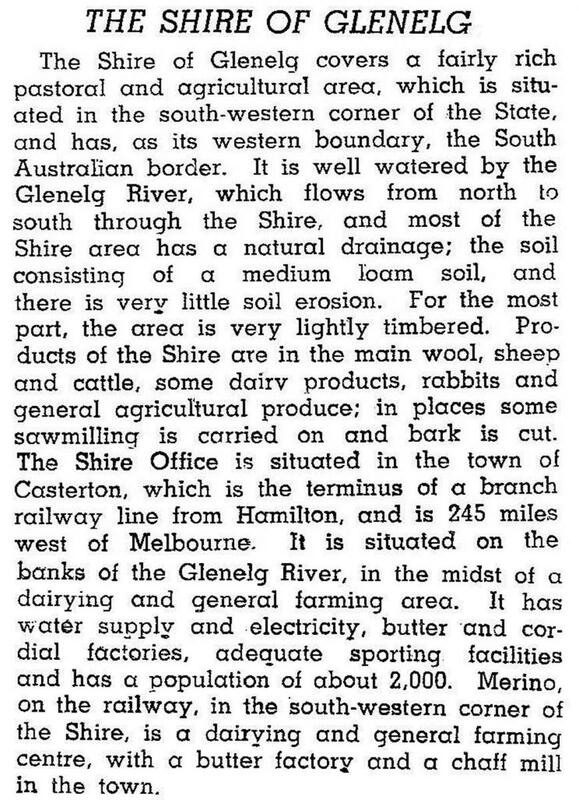 The first Glenelg shire (1864-1994) extended eastwards from the South Australian border and was centred on Casterton. The second shire (1994) includes all of the first, along with a southern area which extends to the coastline. Its administrative centre is Portland. Both shires are named after the Glenelg River, a stream which rises on the western slopes of the Grampians and runs generally west and south through Casterton and Dartmoor, entering Bass Strait at Nelson. The river was found and named after Baron Glenelg, British Secretary of State for Colonies (1835-39), by Thomas Mitchell, the New South Wales Surveyor General, during his Australia Felix expedition in 1836. The area around Casterton, where the Glenelg is joined by the Wannon River, was the heartland of Mitchell’s park-like Australia Felix lands. It was settled as early as 1836 by the Hentys from Portland, and was probably one of the first regions outside Port Phillip to be completely occupied by European pastoralists. Occupation came at great cost to the Aborigines (see Wando Vale entry). A Glenelg Road District was proclaimed in 1863 and the shire superseded it on 29 June 1864. The village of Sandford was its administrative centre for two years, when a move was made to nearby Casterton. The shire’s northern boundary was an irregular line west of Harrow and its southern boundary was a similar line near Digby. Its area of 3576 sq km was mainly comprised of large pastoral estates until 1900. Closer settlement and two soldier settlement periods changed land tenure to family farms, but numerous Australia Felix homesteads and farm buildings survive. The best example is the heritage registered ‘Warrock’, north of Casterton. Casterton is located on the Glenelg Highway and there was a Hamilton-Casterton railway line (1884-1977). In 1994 farming occupied 58% of the shire. There were 752,000 sheep and lambs, 78,500 meat cattle and 4000 dairy cattle. On 23 September 1994 Glenelg shire was enlarged by the addition of Portland city and Heywood shire, totalling an area of 6212 sq km. The administrative centre was moved to Portland and customer service centres provided at Casterton and Heywood. The enlarged shire includes the Princes Highway and a freight railway line to Portland. The rail service from Portland to Mount Gambier was suspended in 1995. In some places the proportion could be higher, such as Digby with nearly 25% recorded as Uniting church (2011 census).